A fire, a blanket, a snowy day, a cup of tea and a new cookbook. What could be better? 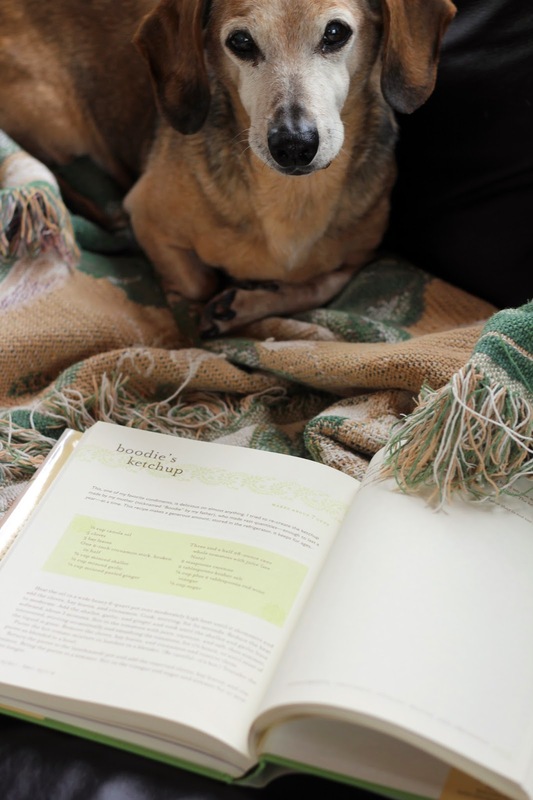 Especially when the cookbook’s title is a surprise, arriving in the mail just in time to curl up for a cozy weekend of reading with a furry friend. My new cookbook came compliments of Joanne, of the lovely blog Eats Well With Others. We are participating in the Food Blogger Cookbook Swap, a terrific event being hosted by Alyssa of Everyday Maven and Faith of An Edible Mosaic. The idea behind the swap is to share books from our collection with other food bloggers. I sent a book to someone and received one in return. So much fun! Joanne chose well for me. She noticed from my blog that I revel in spices (so true!) and thoughtfully selected one called One Spice, Two Spice by Floyd Cardoz. The author grew up in Mumbai and Goa and now cooks in New York City. He shares some personal bits throughout the book and gives a little history of each recipe. Right away the title intrigued me and I knew I’d enjoy diving in ... I was right. 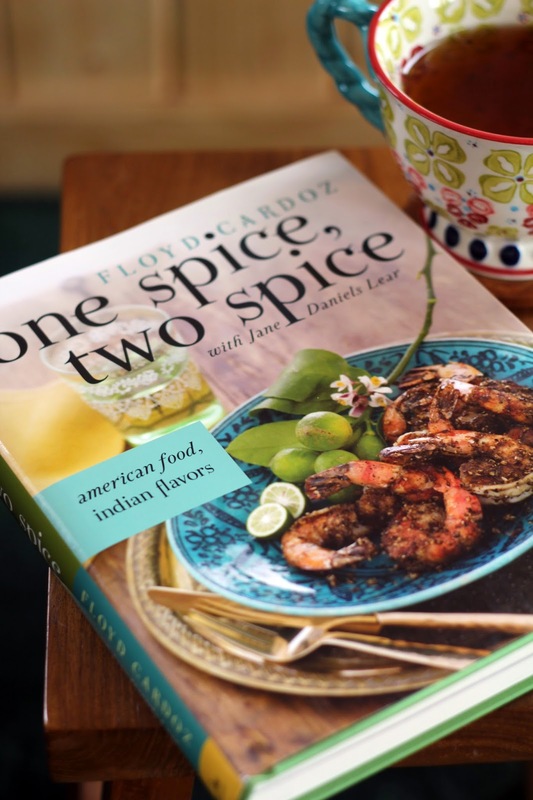 The book brings together two cultures, American food cooked with Indian spices. I traveled in India seven years ago and really appreciate Indian flavors. The first section I flipped to was the condiment chapter. 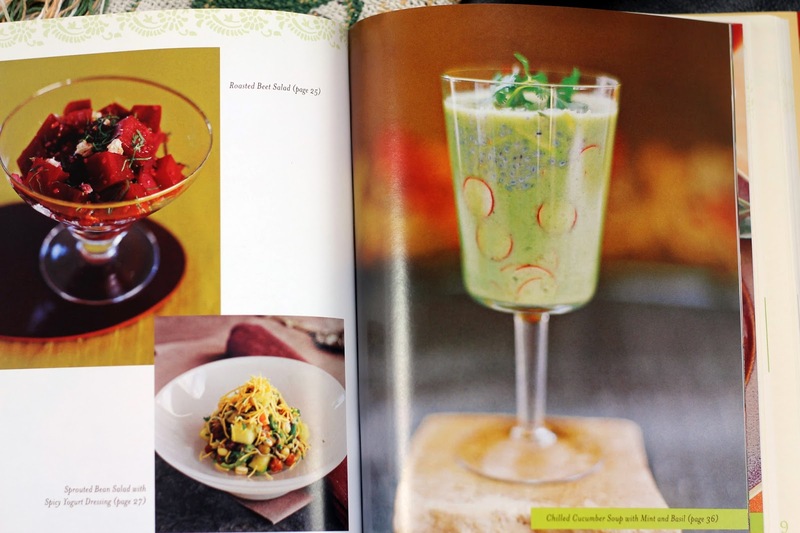 Chutneys, pickles, raitas and dressings – yes, please! 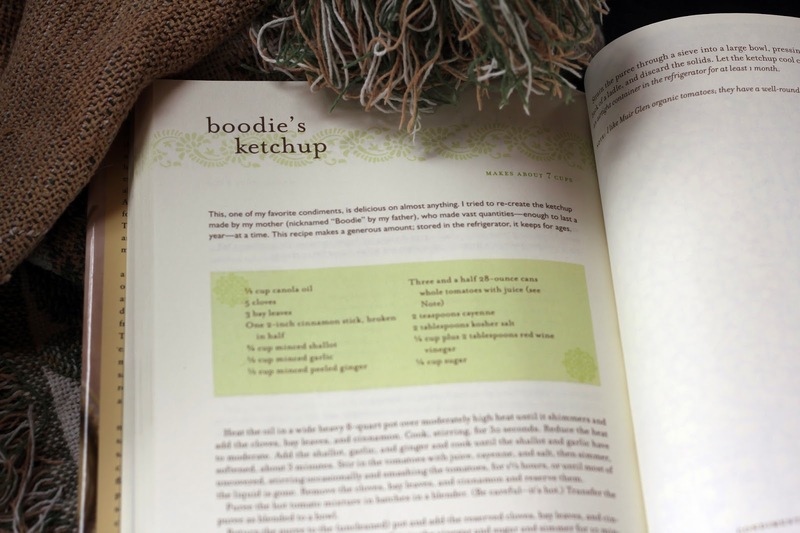 I began marking recipes to try and Boodie’s Ketchup, named for the author’s mother, is top of the list. This tomato-based condiment is flavored with cinnamon, cloves, ginger, shallots, garlic, cayenne and vinegar. Need I say more? And as I perused other chapters in the book many other recipes leaped out. Come summer, this pretty Chilled Cucumber Soup with Mint and Basil is sure to refresh. I’m always happy to add fresh inspiration to my cookbook shelf and appreciate this chance to meet fellow food bloggers. Thank you for your delicious choice, Joanne! And thank you to Alyssa and Faith for hosting. Now back to my menu planning! I enjoy discussing homemade condiments here and I’m delighted that this month’s Tasting Jerusalem features one of my very favorites, zhoug. 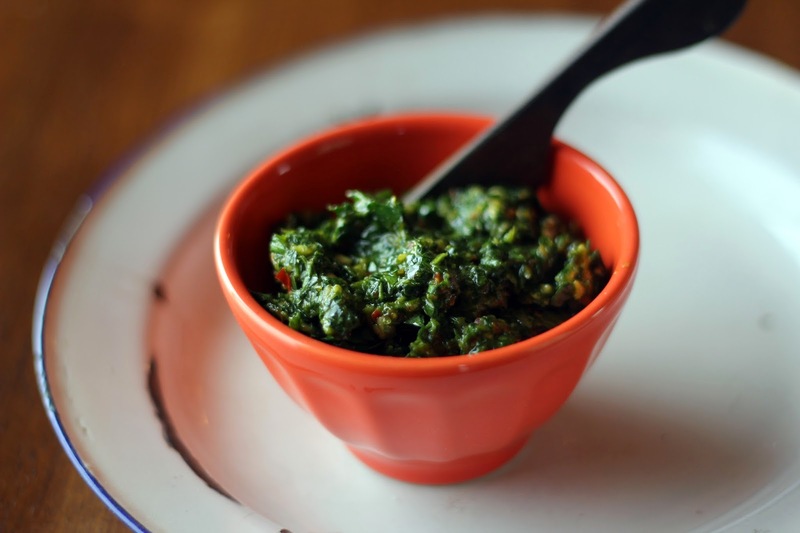 I’ve shared my love of zhoug before, the fiery, green herb sauce that I discovered through Bob’s host mother many years ago during my first visit to Israel. Just a bite transports me away from the winter chill here back to those hot summer days. This versatile condiment is popular in the Middle East and a true pantry staple. A quick whirl of fresh cilantro, parsley, olive oil, garlic and chiles in the food processor is all that is needed to create zhoug. Fragrant, spicy and vibrant, it livens up any dish it graces. Especially welcome during this time of season! We usually dollop some in chicken soup or scoop a bit onto a plate of scrambled eggs. 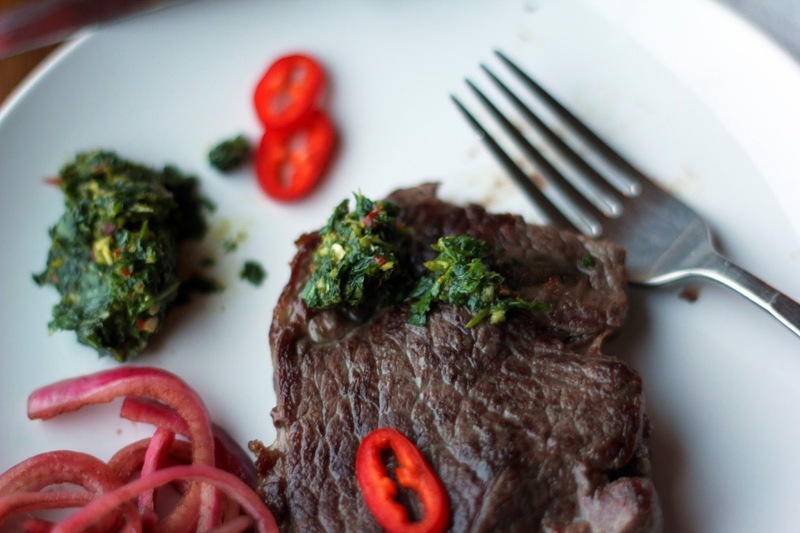 This past weekend, though, steak was on our menu and I started thinking about chimichurri sauce, the Argentinian green sauce traditionally made with parsley, olive oil, garlic and vinegar and served with grilled meat. 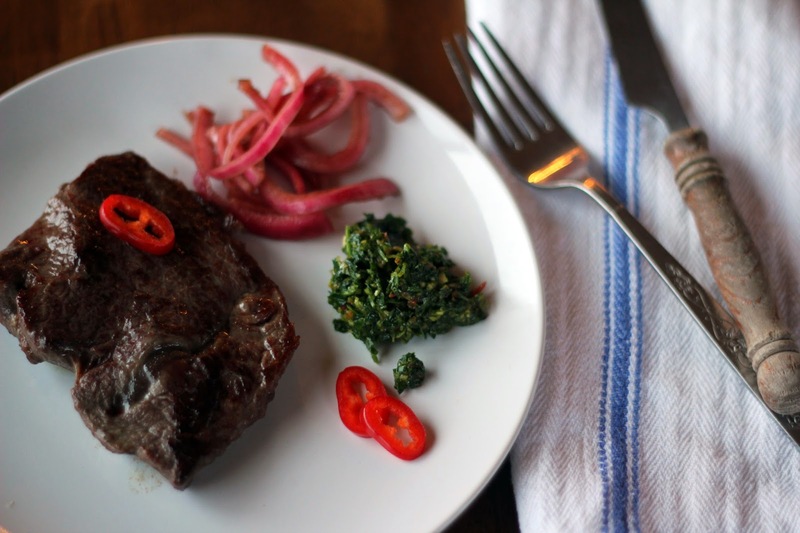 Why not serve zhoug with steak in a similar manner? I grabbed my bunches of herbs, smashed some garlic cloves, chopped chiles (I had red fresno chiles on hand rather than jalapenos, which added pretty little flecks of red) and glugged olive oil and soon we had steak and zhoug on the table. I have to say, steak and zhoug is absolutely delicious! A few years ago I learned the best way to cook a steak using a combination of stovetop and oven and have been doing it this way ever since. The spicy kick of zhoug complemented the simple taste of the beef beautifully and seriously got my taste buds tingling. 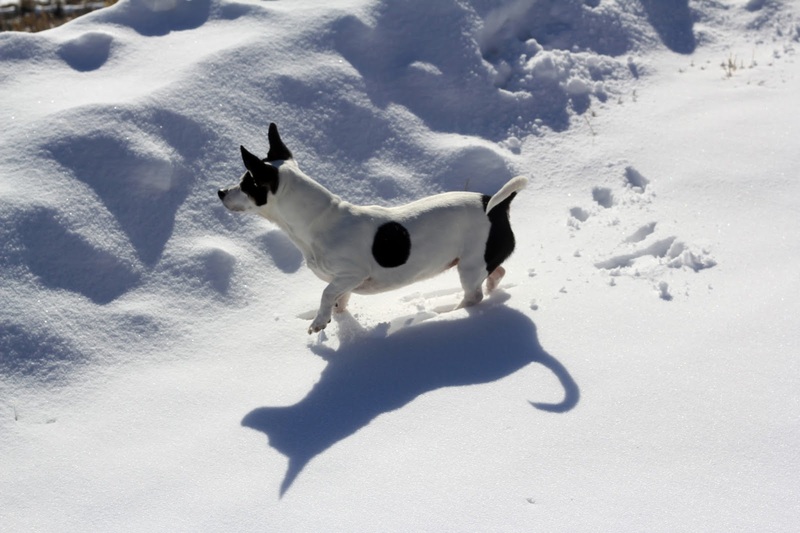 As I look out at our gorgeous white wonderland and watch our cute pup bounce around in the snow, I savor the spicy flavors of the Middle East and feel warm inside. Preheat oven to 450 degrees. Sprinkle a bit of kosher salt over each steak. Heat a cast iron pan large enough to hold all the steaks over high heat and let it get hot. Pour a very thin layer of grapeseed oil in the pan. Lay each steak in the pan and let sear for a minute or two. Flip the steaks and let sear for another minute. Take the pan and place in the oven for five to six minutes, depending upon the thickness of each steak and your preference for how cooked you like them (if you use a thermometer, 115 degrees is the rare end of rare). Remove the pan from the oven and let sit for five minutes to collect the juices. Spoon on dollops of zhoug and serve.